As my post on the DSA blog (re-posted here) stated, I worked the booth at the Arlington Guitar Show. I enjoy working the booth at guitar shows, because it’s a chance to play guitars I will never own. Some of them were worth so much money, I just look at them from a distance. If I see a good deal on a guitar that looks, sounds, and plays really nice, I take two deep breaths and move on. If I take another guitar home, I’ll need to take divorce papers with me. So I look at the newest gadgets, like capos, picks, etc. For many years, most guitar players used Fender medium picks. Of course it was not entirely universal, but “as a general rule.” The shape would change, depending on the instrument. If you wanted a new sound, you changed the brand or gauge of string you used, or even the guitar. There weren’t as many different picks back then, so changing picks usually never crossed a guitar player’s mind. I did, however, change from Fender medium to John Pearse medium, which I still use. It has an offset point which is easier for me hold and attack the strings. My statement about “most guitar players,” refers mainly to acoustic guitarists. Although a lot players I knew used medium exclusively, more and more guitarists began using heavy gauge picks for playing electric guitars. Now it’s all over the map as far as shapes, gauges, and types of materials for picks are concerned. Which is precisely my point. Since I had to set my sights on lower cost items, I started looking into different picks at guitar shows. It’s incredible how many different materials they make picks with. Now I have a lot of different picks. But I’m still married! Then I was introduced to V-Picks. Each of the picks has a different tone or resonance. 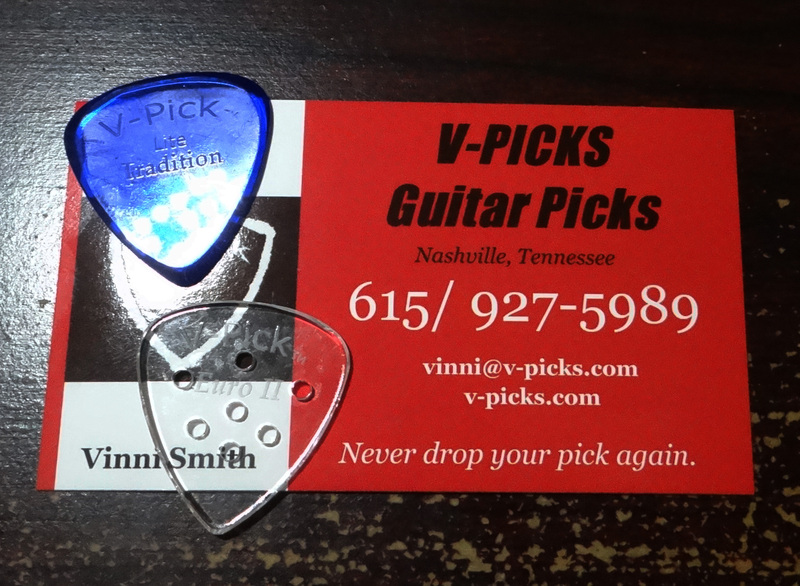 I am experimenting with different picks in their line, but my mainstays are the blue Lite Tradition and the Euro II. I stocked up at Arlington show because they always have their biggest booth there. I also like to see the different picks they’ve come up with. Even though they’re made of an acrylic/glass type of material, they still wear down. It takes a little doing, mind you, but they still wear down. One of the good points of the picks in general – other than the unique sound – is that it sticks to your fingers with the heat in your hand. It’s hard to lose these picks while playing. Give them a try. At the very least you’ll make some good sounds and have fun.